Published in the Hawai’i publication, Ka’u Landing, in 1999. It gives a good look at the history of our land. Just outside Pahoa, on twenty-five acres of former guava orchard, lies a quiet vision of farming’s possible future. 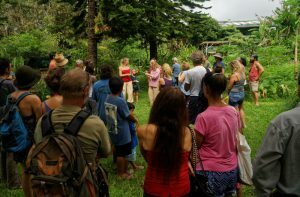 Over the last seven years, La’akea Permaculture Gardens has developed from an idea into a model teaching facility of a sustainable land use method known as permaculture. Pioneered in the late 1970’s by author and permaculturist Bill Mollison, as a result of extensive travel and observation, he defines it simply as “a design system for creating sustainable human environments”. In an attempt to demonstrate the greater advantages of this approach, Executive Director Don May and a staff of dedicated and hardworking students and teachers at La’akea have devoted their time, sweat, and in some cases, even their lifestyles, to creating a living example of sustainable, earth-restorative farming practices right here on the Big Island. “We look at Nature and model what’s going on there, because Nature is the greatest teacher” he states with a smile. Arriving in the fall of 1992, shortly after its purchase by Dr. Beatrix Pfleiderer, Don set to work managing the creation of a permaculture model on the site. “The vision of La’akea Gardens was, from the beginning, of a place that would model and teach earth restorative living and agricultural practices, while exploring individual and collective healing”. The reality however, was less than encouraging in the beginning. Originally an ohia forest that had been partially bulldozed to accommodate a commercial guava orchard, the plot had been abandoned for several years. Heavy annual rainfall combined with the persistent use of herbicides during the orchard’s active years had taken a harsh toll on the soil. Depleted and very rocky, it was slowly restored through sheet mulching and other soil restorative techniques. By early1994 La’akea Permaculture Gardens was incorporated, and after leasing the land from Dr. Pfleiderer, began developing the infrastructure to house farm apprentices. The first full course, held in January 1997, has since that time has hosted students from as far away as Poland, England and Argentina. Powered by solar energy and situated on a slight incline, the farm was intentionally laid out to face roughly south, maximizing year round sun exposure, a big plus for most tropical fruit trees. Irrigation was also designed to be a simple matter. Working with the natural topography of the land and the laws of physics, strategically placed catchment tanks collect rainwater, and then allow gravity to pull the water through pvc pipes to wherever water is needed. No pumps, no sprinklers, no wasted energy, just observation and manipulation. The water directly supplies the needs of the farm’s two greenhouses, in which grow a wide selection of edible green delicacies such as bok choy, beets, carrots, ginger, tumeric, squash, pumpkins, eggplant, and a variety of other greens. Because space and economy are always a consideration in greenhouse growing, plants are arranged in a growing arrangements called a “keyhole paths”. Grown in narrow strips around a keyhole shaped access path, it allows what Don calls “the greatest bed-to-path ratio”. He continues “One of the more subtle concepts in permaculture is mimicking the economy in natural patterns”. With the keyhole path, no available growing space is wasted, and the farmer enjoys easy access to each and every plant. Outside the greenhouses, in a large fenced enclosure, prowls the source of fertilizer for the greenhouse veggies. Moving together in a semi-menacing gaggle, nine geese, together with a cohort of fourteen ducks and a “smattering” of chickens, zealously mow large areas of grass outside the structures. Keeping the area pest free, the marauding unit performs the double service of providing valuable nutrients for plant growth. The natural byproduct is collected with scoopers, mixed with straw, grasses and black volcanic cinder ash in a compost heap, and applied to the growing plants as needed. Beyond the geese and greenhouses, the landscape begins to take on the feel of a naturally wooded tropical zone. This impression is deceiving, however, because although the landscape has the appearance of a naturally evolved woodland ecosystem, it’s really the result of intelligent planning and manipulation in true permacultural style. Figs, mango, peach palm, awa, jackfruit, longen, callandria, and a multitude of other flora appear to dot the landscape in nature’s usual whimsical fashion, yet most were thoughtfully chosen and placed together to form balanced symbiotic units. This method is referred to in permaculture as “stacking”. Stacking is another way that farming takes its cue from nature. “The key to sustainability is diversity” explains Don, “If you know your plants, you can place and design anything for maximum yield, productivity, and the disease resistance you find in Nature”. Walking past a “stacked” arrangement consisting of a loquat tree, mint, comfrey, chayote vine, taro, and the legume pigeonpea, he explains their relationship to each other. “The loquat tree has medicinal value, and since it’s taller than the other plants, it also acts as a windbreak. The mint and comfrey make good ground cover. The comfrey, having very deep roots, also acts as a bio-accumulator, bringing up micro-nutrients from the soil”. Pointing to the chayote vine winding itself in and around the loquat, he continues, “Chayote is an edible squash root. The taro fills an available niche, and pigeonpen is a nitrogen- fixing legume which is also used for mulch”. The entire three-dimensional arrangement is also very space efficient, taking up perhaps 5 to 7 feet of total ground space. Additionally, the farm boasts five butyle rubber-lined fish ponds, which, of course, serve multiple functions- providing a stock of fish for the farm’s use, nutrient-rich “fish water” good for soil and plants, and, of course, a place for the ever vigilant geese and ducks to kick up their webbed feet. Permaculture is not a completely new concept. Other cultures worldwide have practiced its principles to one degree or another throughout history. In Hawaii, the “ahapua’a” was a system of carefully divided, ecologically diverse land units which typically ran from hillside to shoreline. These “lots” were intended to provided a specific group of people with all of their sustenance needs in a manner that continuously maintained the ecological balance of the area. This in turn insured the longterm survival of both people and land. Mollison, in his book Permaculture; A Designer’s Manual, speculates that the system “may have evolved out of early errors of over-clearing, excessive burning, and the extinction of useful animals before reaching equilibrium”. In other words, the native Hawaiian most likely learned early on to respect and work with nature’s living systems. “It’s a heritage we need to reclaim from the past” Don states, adding “Right now agriculture is one of the most damaging practices on the planet. I think we’re at a pivotal time, and this generation has to decide now, to take action now”. Currently, La’Akea is funded by capital investments (stock sales), program fees, produce sales, and volunteer labor. Loosely associated with the Institute for a Sustainable Future for the past several years, La’Akea is now in the process of establishing a scholarship fund through ISF to assist low income students in attending workshops and design courses. Students taking the three-week design course offered twice a year have the option of staying on property and acquiring “hands-on” experience in permacultural farming and design. The main bunkhouse, which presently houses a capacity of twenty-five, will soon expand that number to forty. “La’Akea is an easy place to be” relates Don. “It’s a bridge from the standard disconnected western lifestyle to a more earth-based, integrated, whole way of being”.